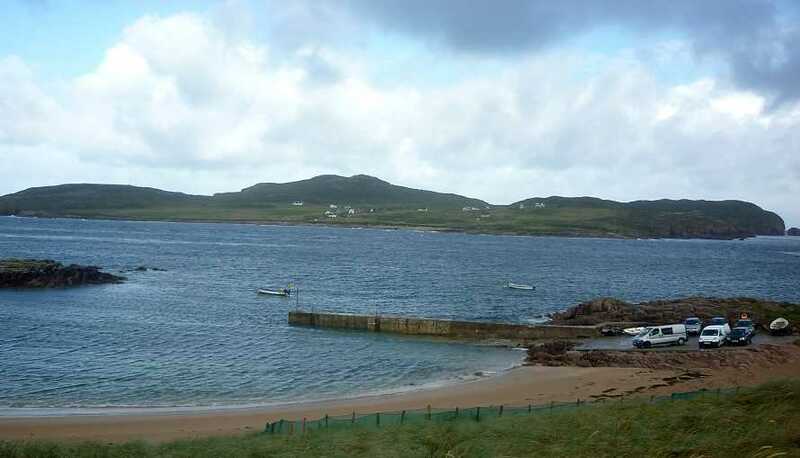 Picture from group : Owey Island and Moylemore from Cruit Island. Picture: Owey Island and Moylemore from Cruit Island. Go and enjoy this excellent Binnion. 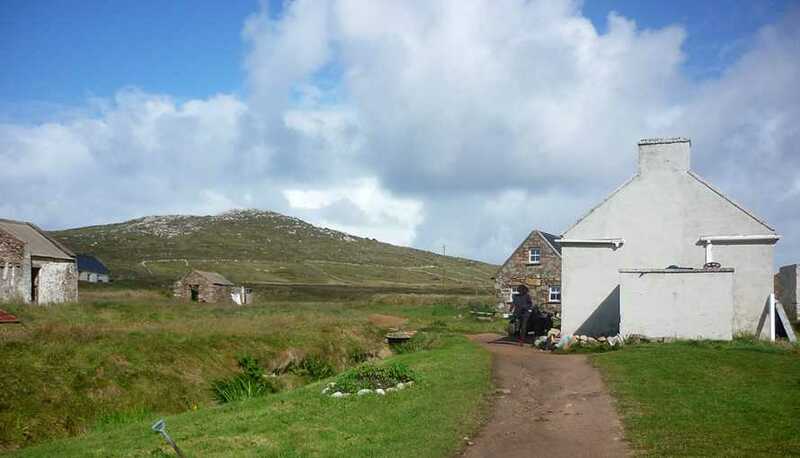 I followed in the footsteps of Chalky and Harry Goodman with a trip to Owey Island two weeks ago. Cruit Island is connected to the mainland by a bridge. At the north end of Cruit there is a pier down a sandy/stone track just before the golf club house. Call Dan Betty in advance on 0866013893 A and arrange a lift to the island. He charges 10 euro return. He visits the island several times a day on errands, so can match up with your return time easily. 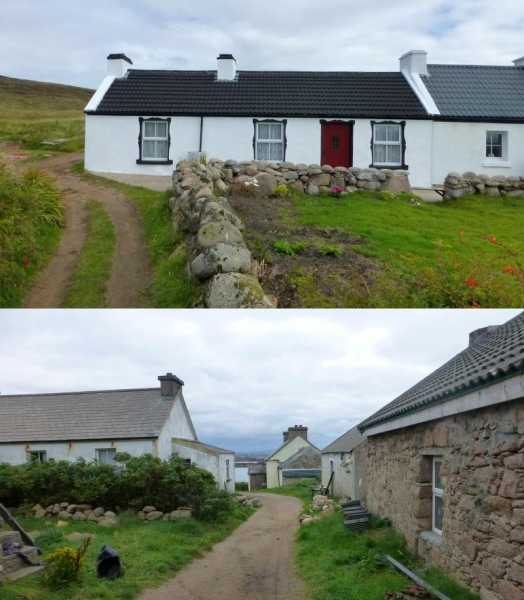 As mentioned by Harry Goodman, there are various modern holiday homes and some farm buildings that are in various states of repair. One shed had the phrase ‘The Donkey Pelvis’ intriguingly painted above the barn door. The island has no permanent inhabitants. There is a rough track from the pier that becomes a grass track. I passed a vegetable plot which was doing well, and a house that was being re-roofed. A little stream passes through the village, with front doors just a few feet away. It was all very quaint! I took a 2 hour ramble around the island, first visiting a small summit to the SE, then following the rugged coastline north admiring the cliffs, tors and sea stacks along the way. 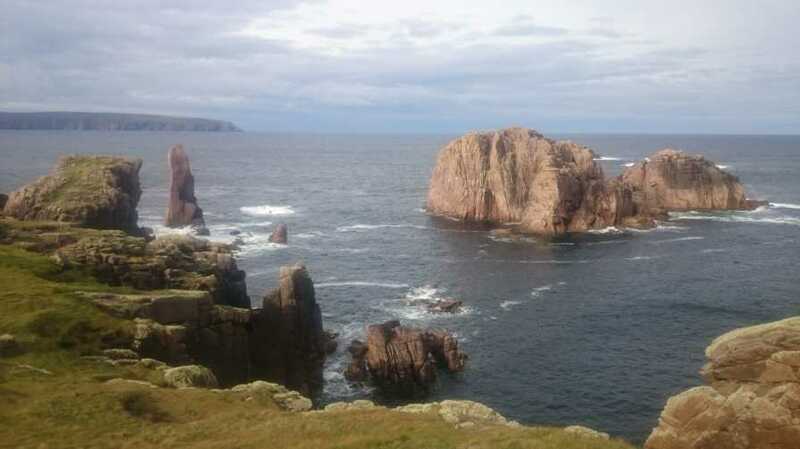 Iain Miller has written about these sea stacks, as has David Walsh in his book ‘Oilean’. I’m not a mountaineer and only those with technical climbing knowledge, experience and gear will venture out to these rocky outposts. As I rambled along, some herring gulls alerted me to their presence, and I prudently veered away to assure the birds I posed no threat to their nests. Previous experience on Inishark and Ireland’s Eye told me that these gulls mean business when protecting their nests! Chalky and Harry Goodman have documented that the main summit of Owey actually has two high points about 100 metres apart. The eastern side has the trig pillar and the western side has a boulder about 6 feet high as pictured by Harry Goodman. Harry’s little cairn helped me climb up. 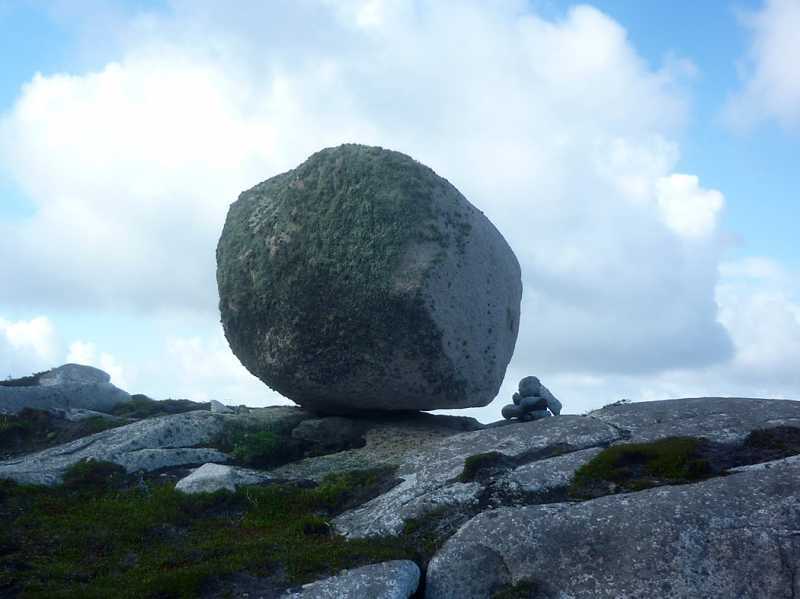 It may only take a large storm to send it rolling down the hill, so get there quick to see this erratic erratic! Below the summit to the NE is a small lake. It is just 30 feet or so from the edge of the cliffs. A huge area of cliff-fall is nearby, which has partially blocked/filled in a deep cleft in the cliffs. I pondered taking a refreshing drink of the lake water, but decided against it. Later Dan Betty, told me that he and others go up to the lake to put their feet in so that little fish can nibble away the dead skin cells and rejuvenate their feet! Don’t drink the water…! Picture from magicstep : Houses and fancy narrow roads for a donkey or quad. Picture: Houses and fancy narrow roads for a donkey or quad. Possibly the highest point on the hill !. Picture from Harry Goodman : The approach to Moylemore from Owey Is. village. Picture: The approach to Moylemore from Owey Is. village.